Revenge is one of the oldest and most pervasive storytelling themes found in literature, film, and theater. Interactive entertainment frequently trades in this convention as well, giving players the tools to pursue justice unbound by the restraints of law and order. Arkane Studios has made the conceit the calling card of its Dishonored series, preserving the quest for vengeance as the sequel’s central theme. Fifteen years after Emily Kaldwin ascends to the throne following the assassination of her mother, Dishonored 2 begins with an unexpected (and abrupt) coup. 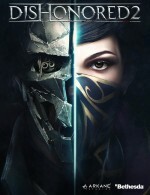 Depending on the choice you make in this pivotal turn of events in the throne room, either Emily or her father Corvo Atttano (the original Dishonored protagonist) must voyage to the southernmost point of the empire to unravel the conspiracy of this successful putsch and exact vengeance. Dishonored 2 wisely preserves the play style flexibility of its predecessor, but better balances the scales between choosing a blood-soaked, high-chaos approach and a nonviolent, low-chaos solution. Whereas the first game failed to deliver a compelling progression for stealth-minded players, the distinct powers Emily and Corvo wield are equally useful for avoiding detection and taking a pound of flesh from every enemy you encounter. Stealthy players will also appreciate the addition of nonlethal drop takedowns and a small timing window that allows you to choke out enemies after stunning them during combat. 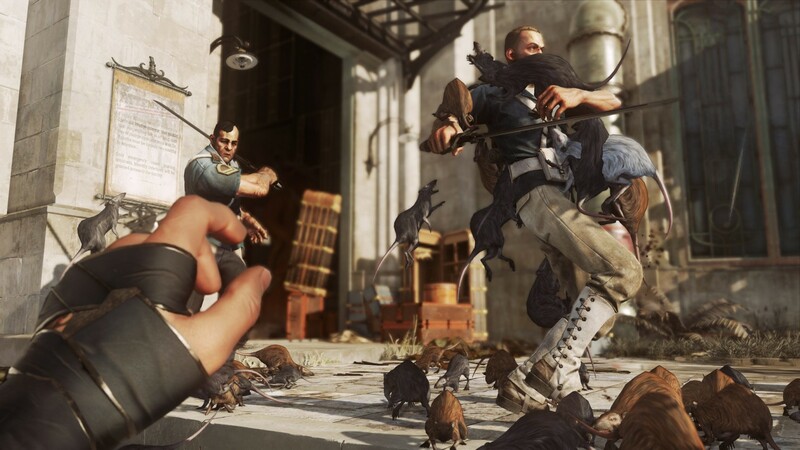 Corvo retains the same supernatural arsenal as the first game – allowing him to bend time, sic swarms of rats on enemies, and possess animals for a brief moment – but each skill now upgrades in multiple ways via branching paths using runes you can find hidden throughout the levels. On the other hand, Emily brandishes a suite of brand new abilities, making her the more interesting choice for a first playthrough. The doppelganger and mesmerize powers are useful diversions, and the shadow walk skill makes her much harder to spot when moving through heavily patrolled areas. Each of these has value, but the star power of the game is domino. Once fully upgraded, domino allows you to tie the fates of several enemies together via a psychic bond. Incapacitating or eliminating an entire room of guards in one fell swoop always feels gratifying. You cannot unlock every upgrade for either character in a single playthrough, which makes the weight of rune-spending decisions heavier and encourages replayability. The addition of bone charm customization and a no-powers mode also give you variables should you choose to play multiple times. The story is largely the same no matter which protagonist you choose, but Emily and Corvo’s unique voiceovers give new perspective to unfolding events. Also expect to stumble upon nooks and crannies you may have missed earlier. Whatever approach you choose, Dishonored 2 rewards situational analysis, patience, and experimentation with the supernatural powers at your disposal. The game shines when you treat each enemy encounter like a puzzle, discerning whether to lure enemies into traps, pit them against one another, or evade them altogether with some deft navigation and sleight of hand. Stumbling upon solutions like turning the mechanical clockwork soldiers against their creator is a true joy of the game. The excellent level design plays a large role in creating these improvisational opportunities. Dishonored 2 is at its best when it pushes beyond its comfort zone with standout missions like the Clockwork Mansion and Stilton’s Manor. Each introduces a room- and time-shifting mechanic, respectively, that increases the navigational challenge and opens up new opportunities for clever takedowns. The sunny island city of Karnaca feels radically different than the cold and foggy industrial capital of Dunwall, and its locales are much more diverse and many environments bustle with civilian activity. Eavesdropping on passersby gives more color to the experience, and Arkane deftly created several navigational puzzles that must be solved to reach the location of the various runes, bone charms, and lore. The minute-to-minute experience isn’t radically different than the first game, but feels honed. Given the excellent environmental storytelling, the rushed and underdeveloped main story beats surprised me. From the abrupt usurpation of the throne to the final showdown, Dishonored 2 never slows down enough to create meaningful context to the events or banter between the main characters. When another claimant to the throne appears out of nowhere, we are expected to believe the entire Dunwall court just takes her word at face value and abandons its ruler as thoughtlessly as a dim guard abandons investigating the shadowy figure that just darted past. The narrative isn’t bad, but could have been much more impactful with better execution. To get the most out of it, I highly recommend you play the excellent original game and its DLC first. The ending is largely the same no matter how much blood you spill during the course of your revenge campaign, but the epilogue cutscene that follows has several permutations based on who you killed and spared. In general, the chaos system seems more forgiving than the previous game; killing particularly devious people does not harshly penalize players who otherwise show compassion and restraint. As with the last game, leaving corpses all over the world results in a bigger infestation of the local pest (in this case, swarms of dangerous blood flies), adding an extra layer of difficulty to backtracking for action-oriented players. The only tonal imbalance relates to looting, which does not factor into the chaos system. The former leaders of the empire can steal from the poor and the rich alike with no consequences. Since coin plays a critical role in upgrading weapons and replenishing supplies, you are essentially encouraged to embrace the life of a burglar. Dishonored 2 successfully builds on the solid stealth-combat foundation of the original while introducing enough fun new gameplay concepts to feel fresh. Whether you prefer sticking to the shadows or gutting every co-conspirator in the land, the game offers a rewarding experience with attractive upgrade paths. The narrative doesn’t match the high bar of the gameplay and world building, but Arkane Studios nonetheless delivers a must-play revenge tale among the best in its class. I played through Dishonored 2 on the PlayStation 4 and had a largely stable experience, with only one hard crash. However, other GI editors have reported framerate issues on the Xbox One S, and the PC version is suffering from optimization issues Bethesda hopes to address with a patch due later this week. In the meantime, the publisher urges players to use the recommended settings posted on its site. Dishonored 2 successfully builds on the solid stealth-combat foundation of the original while introducing enough fun new gameplay concepts to feel fresh.